Visibility of Comet PanSTARRS in the Northern Hemisphere (Credits: NASA). €359 is the price for the special, two hour flight that 88 lucky amateur astronomers will take to watch the PanSTARRS comet on March 16. The Bonn-based travel agency, Eclipse Travel, has joined charter agency Air Partner and airline Air Berlin to offer astronomy enthusiasts an amazing view of the comet, expected to fly through the Northern Hemisphere by next Thursday. The comet is already visible in the Southern Hemisphere. “Observers [..] say the comet can be seen with the naked eye even through city lights. Currently, it is about as bright as the stars of the Big Dipper. The comet could become even brighter when it moves into Northern Hemisphere skies in the second week of March,” SpaceWeather.com reports. PanSTARRS was discovered in June 2011 by the Panoramic Survey Telescope and Rapid Response System (Pan-STARRS), which sits atop the Haleakala volcano in Hawaii. A comet is an icy small Solar System body that, when close enough to the Sun, displays a visible thin, fuzzy, temporary atmosphere and sometimes also a tail. This is due to the effects of solar radiation and the solar wind upon the nucleus of the comet, composed of loose collections of ice, dust, and small rocky particles. 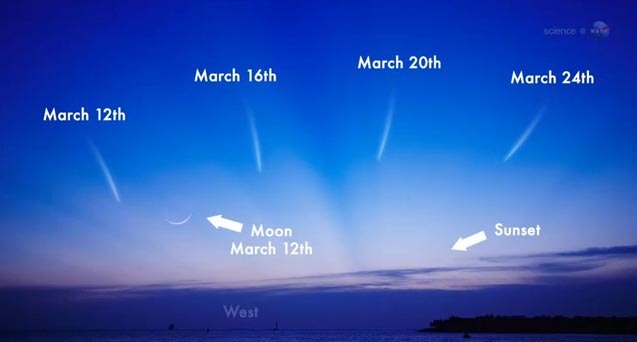 If you won’t be able to see PanSTARRS next week, do not worry, another comet will pass close to Earth in November. Comet ISON was discovered by two amateur astronomers in Russia in 2012. If not destroyed by the Sun, it has the potential to be so bright that it might be visible in daylight, without booking any special flight.